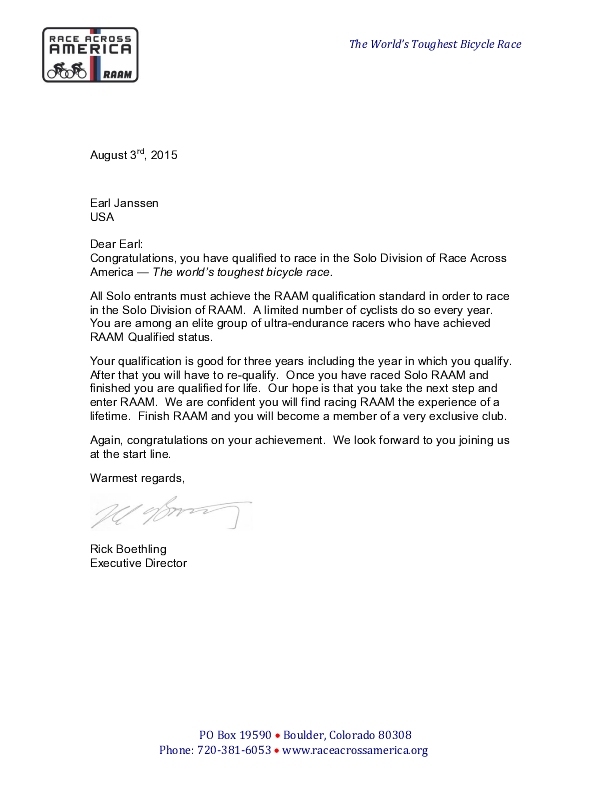 Every RAAM competitor and crew must be highly adaptable within the rules. In a race that uses public roadways and takes up to 12 days to complete, just about anything can cause plans to be adjusted. In this post, I simply want to give you a description of a few of those things we encountered (in no particular order). The most frequent causes of adjustments to our ride plan was related to the reality of our physical needs. Use your imagination. Our vehicle was stopped for usually a few minutes at a time at most. Sometimes the retiring rider is approaching more rapidly than the bladder is emptying. Good planning means that the next rider is not the one along side the road “making water”, but good planning doesn’t always happen. The time cooped up in a vehicle, a diet high in carbohydrates and very little fiber also meant that constipation was likely. Good facilities were few and far between … especially if elimination takes a little while. An extra long turn on the road or a different rider than expected getting out there can be the result. Sleep is also a condition in which adaptation happens. There were times one rider would ask another to take another “turn” just so that an hour of sleep could be achieved. We may describe that our plan was 15 minutes every hour for each of our riders, but that was just the plan. The reality was often different. Some of the delays we encountered resulted in detours. More about that in the next section. Summer in the United States is the time for road construction. Road construction, as you well know, is often accompanied by flaggers and one lane of travel. Cyclists are not immune. One particularly frustrating delay because of road construction happened in Colorado. I exchanged with a retiring rider one afternoon at the top of a hill on a very warm day … 95°F and not a cloud in the sky. I had a fast descent and then I knew I would be climbing, paying it all back. As I got halfway down the hill, I noticed cars were stopped. I kept going on the shoulder of the road, all the way up to the flagger, a young woman nearing the end of her shift. I asked if I could go on ahead (hey, it doesn’t hurt to ask!) and was told, “No! You have to wait.” (I figured.) I waited. I sweated. I waited some more and then we struck up the obvious conversation about what I was doing, how far I was racing, and how crazy this all was. Finally, cars started coming down the other way. The flagger grumbled about how slow they were going. She grumbled about how there was too much space between cars. She grumbled that they let too many cars come through. Then, when the last car came through, it was time for the construction trucks to proceed. Remember, I’m sweating while I’m waiting. I’ve now emptied my water bottle it is so hot. Finally it was time for us to go. I was told to be careful because there was no real shoulder ahead. Did I say that the flagger was at the bottom of the hill, so I now had the climb with no real shoulder and a mile-long string of cars behind me? This delay was between 10-20 minutes long. We called it in, but got no credit for that wait. Another time, I again saw a line of cars stopped in the roadway. Again I pull up to the front of the line (this is a race, remember!) and I began to talk to the police officer holding back traffic. A restaurant was on fire. The road was closed in both directions because the fire department was on its way and the fire hydrant was located across the road from the restaurant. The officer guessed the road would be closed for hours, and that he was simply waiting for word about where the detour should go. He was aware that I was riding RAAM and wanted to help, but couldn’t let me through. We began to discuss detour options. It sounded like the closest detour would add about 5 miles to the ride. He told me to wait a minute. He then went on foot to his counterpoint blocking traffic going the other way, and after a couple of minutes of animated conversation with hand waving and frequent use of the radio, he came walking back and moved his car and traffic began flowing once again. The restaurant was still on fire, but evidently the fire department brought in a pumper truck. That delay was also about 10 minutes. Delays due to mechanical failures also contributed to a change in plans. Twice with our two riders, as we pulled a bike off the rack and set it on the ground we discovered a flat tire. Each time the other rider in the van took an extra turn while the other pulled the bike into the van and repaired the flat. The other two riders were not so lucky. They had about 8-10 flats they had to adjust to, and for each one, there was a bit of a delay and an impact on rest and sleep. The biggest mechanical failure was a result of road construction. One rider was stopped at a flagger. The flagger insisted that the cyclist proceed over unrolled newly laid asphalt. The cyclist objected, but the flagger was insistent that the cyclist could not ride in the roadway. The asphalt stuck to the wheels, to the brakes, to the drive chain and about $1,000 worth of damage resulted. The tar destroyed the derailleur, the derailleur hanger, bent 3 links of the chain, and bent a tooth of a rear gear. The cyclist had to change bikes. The cyclist was verbally abusive to the flagger. Even the normal construction caused some delays. The flaggers might wave us through fairly quickly, but traffic was often slower than our usual pace, and very hazardous. In one place there was a convoy of equipment going the same direction we were going. We first encountered the roller, then machines laying asphalt, then machines melting asphalt (that’s pretty hot going by one of those on a bicycle! ), and finally the milling machine removing old asphalt. What a mess to be riding by that while the work is going on. Traffic accidents/incidents caused delays. I jumped on the bike in Sedona, Arizona. It was a crazy, congested town with a lot of traffic and the downtown area full of construction cones and very narrow lanes. Leaving the town means going uphill. As I started the climb, traffic came to a complete stop on the narrow, twisty road. Passing the cars that were stopped, I came upon a fender-bender. There was no shoulder, so the vehicles in the accident simply stopped in the roadway. I went around them, but that meant that my follow vehicles were stuck in traffic. I climbed. I climbed some more. I hit the switchbacks and still I climbed. This was a long turn on the bike since none of the support vehicles could get through until the accident was cleared. By far the thing that impacted us the most were the detours. Many of them were known by race headquarters and specific instructions were given as to the approved detour. For instance, one bridge over a railroad track was being repaired and no longer had a deck on it. The detour was a simple 3 miles, 1 mile south, one mile east, one mile north. Simple … except for the fact that it was all on loose, dry gravel. The amount of traffic using the detour meant that the dust was so thick that it was hard to see a vehicle ahead of you. Early June saw heavier than usual rains in the middle of the country. Flooding took out many planned sections of the route. There were brand new routes communicated by race headquarters to the racers. In Jefferson City, Missouri, the flat, fast route was replaced by a convoluted, very hilly route, through some of the rougher sections of town, with a lot of stop signs and traffic lights. We hit that at night. Flat? Not at all! On my turn, I had a 15% uphill just as I got on the bike. Yes, a bit of delay compared to the original planned route. Not all the detours were planned. In fact, I can think of at least two occasions where we were one of the first to encounter an emergency road closure. One was a bridge that was flooded in Maryland. The other was in the middle of the night in some small town in some state where police had closed the road (traffic accident?). Before each of these detours, a call had to be made to headquarters, the road closure described, they had to select a new route, and we got to ride extra miles. While most of the things above didn’t necessarily affect all teams, and certainly did not affect all teams evenly, every team encountered issues. By far the greatest factor challenging the riders plans had to do with road/race conditions. Temperatures in the desert were 5-10°F hotter than usual. Extreme heat warnings were out for the first few days of our race. Winds hitting one team in the face might change up to being a strong tailwind for a team a few hours ahead or behind. Sand blowing across the road near the Salton Sea didn’t affect everyone. Some teams didn’t have a drop of rain fall on them while we had torrential downpours. Milled roads under construction and gravel roads were unavoidable on certain sections. We were supposed to stay on the shoulder of the roadways as much as possible. The debris on some of those roads made it look like a landfill. The road conditions that nearly ended my race was unpacked asphalt on the shoulder of the road in 95-100° F temperatures. The asphalt looked tight and well packed, but when I hit it at 20 mph it was as if I suddenly was on loose sand or gravel. My bike skidded and fishtailed and only superior bike handling skills and a pulled muscle in my back kept me upright. I signaled to the crew for a rider exchange. I laid on an ice pack for 90 minutes before I decided I could ride again. That muscle still isn’t quite right, giving me some pain at times. Flexibility is a key component of RAAM. There is an overall plan, but as you can see, adaptation is the name of the game. Throughout RAAM, our weather conditions were mostly good. Yes, it was hot … but it was summer! It is going to be hot. We dodged some light rain as we moved through Illinois and Indiana. Sometimes the road was wet from a passing sprinkle, but mostly we stayed dry. It wasn’t until West Virginia, Pennsylvania, and Maryland until real rain fell. It started in West Virginia just about sunset (if I recall properly). It was light enough that it didn’t really matter. I do recall checking the weather radar from my phone, and seeing that the forecast was for some substantial rain through the night and into the next day. All of this is still pretty fuzzy for me. This was happening as I was suffering the most from sleep deprivation. Light rain gear was really all that was necessary throughout the night. That’s good, because temperatures were in the borderline range. There is a point where a rain jacket is too heavy and going without is too cold. That range is different for different people, but it is critical to know. Experience riding in the rain was a “lifesaver” for me during RAAM. I recall the very first time as an adult when I rode in the rain. It was initially unpleasant as I fought to stay as dry as possible. Over the years I’ve discovered that riding in the rain becomes easy and fun as long as it is embraced. I do that by accepting that I’m going to be wet, completely soaked, and simply focus on the ride itself. It doesn’t matter if it is a light sprinkle or a heavy downpour, this is what works for me. The more I try to stay dry, the worse it is. The goal when riding in the rain is to stay warm enough. Wet doesn’t matter. I think I mentioned in an earlier post that while crossing a bridge in Cumberland, a truck coming from the opposite direction splashed through a puddle sending gallons of water into my chest and lap. One of the crew in the vehicle behind me saw the deluge and wondered for a moment whether or not I might lose my balance, so great was the volume of water. I laughed aloud. Any dream of staying dry was now past, and the rest of the ride in the rain was simply going to be a ride in the rain. I couldn’t get wetter! That last day, sometimes the rain eased up enough that it was a light sprinkle. Sometimes it was a deluge. Eventually I shed the rain jacket and went with a vest to keep my core warm. My arms and legs were bare. It was a little chilly, but I decided that as long as I kept my heart rate up, I’d stay warm. It was challenging to get out of the van to climb on to the bike when it was pouring down rain. The van was warm and we started to dry off. Getting on the bike meant more rain and cold. I have always noticed that car drivers seem to be more courteous to cyclists in the rain. They gave me wider berth while passing. It remained challenging to be seen however. Our Planet Bike taillights all started to fail as water infiltrated and shorted them out. Sealing them against moisture was one of those things we put off until it was too late. The worst parts of the ride in the rain were the descents. As my speed came up, the stopping distance grew exponentially. The threat of hydroplaning increased. Visibility diminished as the rain not only hit the goggles but also ran off the helmet onto the eye wear. Maneuvering around obstacles became more dangerous. It was chilly with the air flowing more quickly around exposed flesh. Finally, above 30 mph every single rain drop hitting my face stung like a mosquito bite. Imagine hundreds of those every few seconds! At the end of one descent outside of Rouzersville, there was a turn. One of our crew braved the downpour to signal the turn far enough in advance that I could slow from 30 mph to a safe turning speed. Great thinking Mike! Still the rain came down. A bridge south of Mt. Airy was underwater. We were some of the first to have to detour around that section. Frantic calls to headquarters were made and we made the best of it. In one section, large rocks used as rip rap in the ditch to reduce erosion had washed onto the road surface. These were 20 lb stones! Our logistical van crew helped move some of the stones so there would be no delay for our rider. So, how much rain? I’m having trouble locating reliable information at various places along our route. BWI airport, a few miles off our route recorded 3.11 inches of rain on Saturday. That’s right, this was not a light sprinkle. I suspect that some of the places we rode through had more. The rain slowed us down. As much as we embraced the rain, the 18-20 hours of steady rain had an impact on our speed. Footnote: After RAAM for about 3 weeks, there were some morning rides I skipped because there was the threat of rain or it was lightly raining. There are limits! A switch in my head went off on my morning ride. It was a significant and important change. First, a little background. Near the end of last year, I set 3 cycling goals for 2015. As I moved into 2015 I was most intensely focused on goals 1 & 3. I have a chart and a plan for the riding of 10,000 miles during the year. It paralleled the training necessary for RAAM. RAAM was ridden. 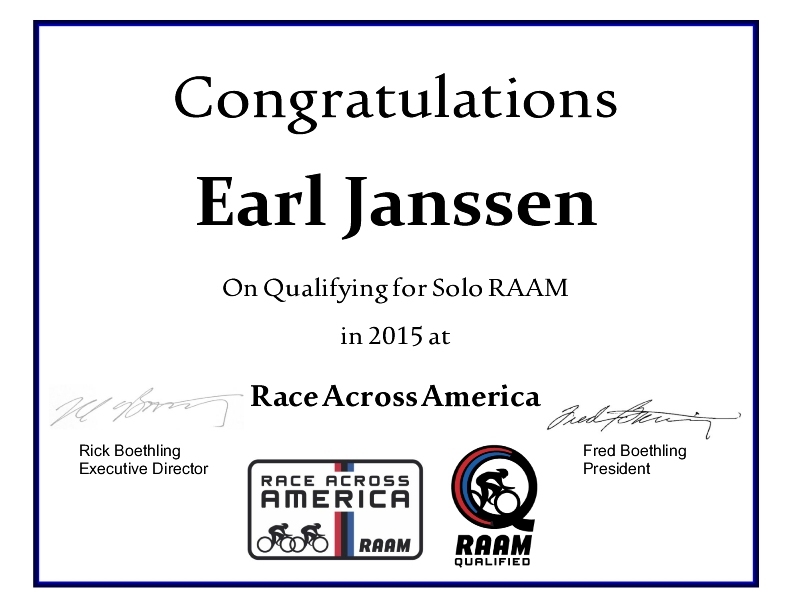 As of the end of RAAM, I was ahead of schedule for 10,000 miles. Life was good. Then, I rode a 200k in July that was a hard challenge. I bonked so bad near the end of the ride that I laid down in the shade for 15 minutes 2 miles from the finish. I reconsidered the 1200k goal. Too bad I was past the refund date, so I was committed to either ride the ride or lose the money I had paid for registration. I remained on the fence. This morning, a switch in my head went off. I found myself planning the ride. How would I attach the bags to my Seven? What pace will I ride at the start to give me enough time to sleep but still complete the ride on time. How does this pace feel? What maintenance do I need to do to have the bike ready for a 750 mile ride (in 4 days)? A few days ago I gave myself the rest of July to relax and planned to start focused training again in August. I guess my head decided to get in the game a few days early. 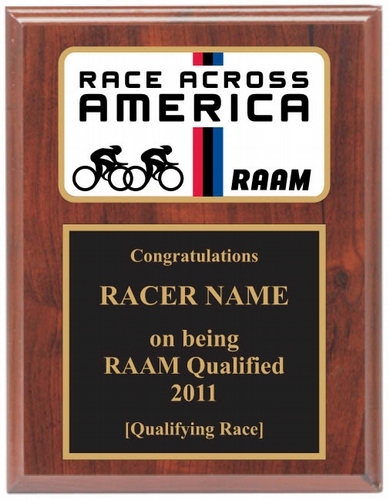 RAAM, The Race Across America, isn’t just a bike ride. It is a race. There are a variety of race categories. There are Solo and Team (2, 4, & 8 person) Categories. There are age categories (under 50, 50-59, 60-69, 70-75, 75+). There are gender categories (male, female, mixed). Combine them all together and one has quite a few different options. We raced in the 4-person, mixed gender 60-69 category. 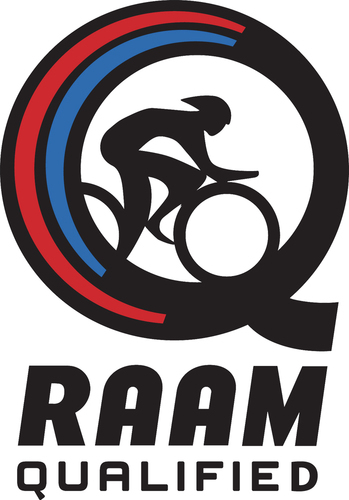 In the history of RAAM team events (since 1992), there have been a total of 6 teams in this category. This year, there were two teams in the category. Additionally, we saw ourselves competing against all the 4-person teams. Our goal was to set the record for the category. Since each year the race covers a slightly different route and will have a total mileage distance different from year to year, the average speed over the course determines the record. The total time simply gives a rough estimate of the performance. There is a short and long answer to that question. First the short answer … and if you want the long answer, you can read through to the end of the post. We came in first in our category with an average speed of 17.5 mph. Team Laughing Dog came in just over 14 hours after us with an average speed of 16.18 mph. Against all 27 4-person teams, we ranked 15th. We were faster than: 2 of the 3 under 50 female teams, the one 50-59 female team, 2 of the 10 under 50 male teams, 2 of the 3 50-59 male teams, the one 60-69 male team, and 3 of the 7 under 50 mixed teams. In a very proud moment, we also were faster than 1 of the 11 8-person teams! We did not set a record. The record speed was 17.63 mph. This was a very respectable time and effort. A race lasting a full week, covering 3004 miles, 55 time stations, and where the clock never stops is a very complicated thing to analyze or evaluate. Additionally, our race covered 41 more miles than the record-setting ride so it is not simply an easy thing to compare one ride to another based on time to each of the time stations. No “official” records were set during this year’s race due to road construction, detours, wind conditions, and weather, including desert temperatures 5-10 degrees higher than usual. (Bike Like a Girl did set a record for an 8-person female team although at least prior to this year, all 8-person teams exist in only one category.) For instance, this year there was a bridge under construction necessitating a detour on loose gravel. While our rider made some good time on this section of gravel, it does not compare favorably to riding the same distance on smooth paved roads. We had several sections where we were completely stopped due to road construction, waiting for the flagger to send us in single file across the construction zone. A fire stopped us once as the road was closed. As I spoke to the police officer, we discussed alternative routes around the closed road. Flooding necessitated detours. One section between time stations was completely re-routed. Wind speed and direction was highly related to the time one passed certain sections of the route. These seem to some like excuses. I simply look at them as variable factors over which we have no control but that affect the speed of the race and the challenges in comparing race results. Compared to the record-setting team (Team GOALED in 2013) our average speed was as much as 2.55 mph average slower at one point early in the race, and as little as 0.08 mph average slower late in the race. We were clearly faster near the end of the race. Compared to the record-setting team our speeds between time stations ranged from 4.95 mph slower to 5.75 mph faster. Compared to the record-setting pace, we were as much as 3 hours 24 minutes behind and as close as 45 minutes behind. We ended up 1 hour 16 minutes behind the record. In western Colorado we were the furthest behind. We were the closest to the record in Hanover, Pennsylvania. We were never ahead of the record pace (even though as I remember it, our crew told us we were). It would be interesting to note the weather conditions and rider dynamics during these stretches, but my memory isn’t good enough to do that very accurately. I know we had heavy rain in West Virginia, Maryland, and Pennsylvania. I know that the heat in eastern California was a factor. I remember struggling a lot in Missouri. Sleep deprivation caught up with us in West Virginia and western Maryland. It is interesting for me to see that we clawed back over 2 hours of the time we lost early in the race. By the time we hit the 5th time station (342 miles, 18 hours 24 minutes), we were far enough behind the record pace (1 hour 26 minutes) that we never recovered. Having said that, I looked at our time to Durango, CO and compared it to the 2015 Race Across the West (RAW) team results. There were 2 2-person teams and 8 4-person teams. They rode the same route and started 4 days ahead of us. Conditions were similar, with very high heat in the desert. Our time was 2 days, 51 minutes. We came in faster than 8 of the teams. We were 1 hour 56 minutes slower than the 1st place team and 12 minutes slower than the 2nd place team. The team that finished 3rd was more than 2 hours behind our time. Not too shabby! And we had another 2150 miles to go! So, having said all that, and crunched the numbers, ours was a very respectable showing and with no other teams setting records this year, our missing the mark by 1:15 is a tremendous witness to a strong team.